Often, when you are on vacation, most things (generally speaking) should be just fine and go nicely with good food, unique experiences, beautiful places, a good hotel etc, etc. If you’re the smallest bit like me, then it’s just has to be a nice experience, when you finally on vacation. Value for money – and preferably without any big negative moments. Of course you can not completely avoid it, but much can be prevented with preparation of your journey. A little bit superficial maybe, but I definitely hate, if we are on vacation, and we stumble upon restaurants, where they serve so-so touristy food (you know, french fries, a chewy beef or food from your homecountry). I absolutely hate it. Because it’s a waste of time, money and not least experience. Think what you might have gotten instead? The talk is the same, when it comes to hotels, wasted driving time on the road, when you can not find your way, when the rented car is broken, etc. etc. I just do not like to waste time. And when it’s finally holiday, I only want to think about relaxing and minimal stress – not worries and irritation. But wouldn’t it be pretty good, if you could get help with some of the most basic ?? After all, we live in a digital age, where you can get help with most things. So why not use the technology? There is travel apps for almost everything, you just have to choose and keep your tongue straight. Last I left I travelled, I decided to try a few apps – just to check, if they were working. I have to admit, that I did quite a try, but forgot a lot of them again. Either because they did not work well in Turkey (or Antalya), but most of all because I traveled alone and just took the day as it came – go with the flow. Some apps do not work well (or optimally in Turkey) because most travel apps depend on user reviews. And for some reason, people have not been so good at it in Turkey. But I think it might come gradually. And I’m sure it will be pretty good, although in some places it’s a bit limited – depending on where and in which cities you travel. Travel apps like Citymaps, citymaps2go and Google Maps are absolutely superb to find your way, show maps and find different sights and local eateries, hotels, etc. Citymaps is super smart because you can get newsfeed from your friends to see, what they recommend. The highest rated attractions, etc. are automatically displayed on the map. You are probably familiar with Google Maps and is therefore useful, when you are abroad. Citymaps2go works – as its name says – without being connected to the Internet, because places are located via GPS and stored on your mobile. It’s pretty often an advantage when you’re out, especially when you’re in Turkey, where the fewest have coverage without paying a medium-sized fortune. Field Trip is also a pretty good travel app, which I tried a little. I was really pleased with that one. Here I got recommendations on exciting sights and architecture, restaurants featured in international media, shops recommended by Cool Hunting and We heart depending on my location. I did not get any unnecessary information. Only for the area I was in. Yes, the app is still a bit limited in Antalya, but it’s always updated and I will definitely use it on other trips. The Rome 2Rio travel app calculates how to best get from A to B. So you select to places, where you want to go, and the travel app makes suggestions about airplanes, buses, trains, ferries, taxis, prices, kilometers, etc. etc. 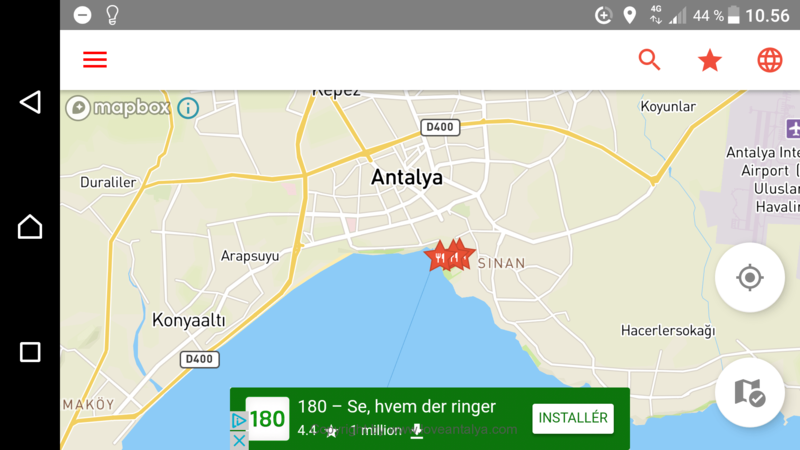 There are even suggestions to nearby hotels, if you should have missed a connection. However, I have not tried it here, but the app seems pretty good. Food is important. At least for our family. 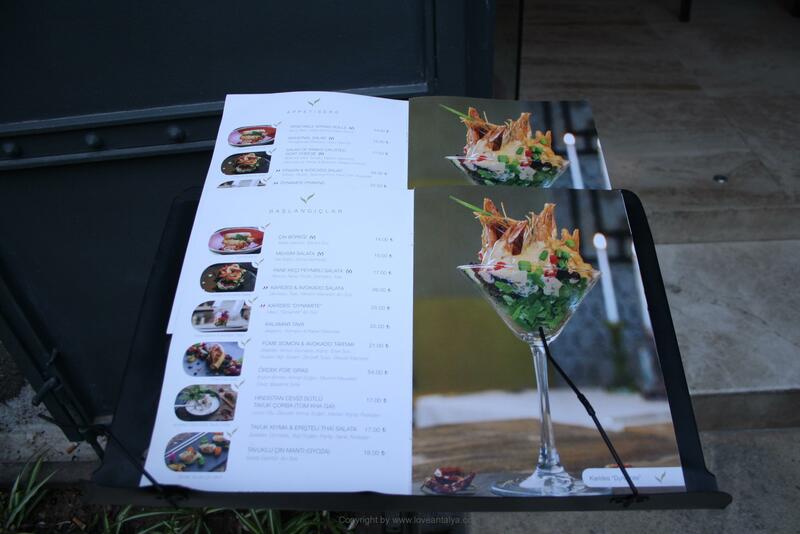 We are quite interested in eating well, healthy, exciting and varied. And preferably what the locals eat. 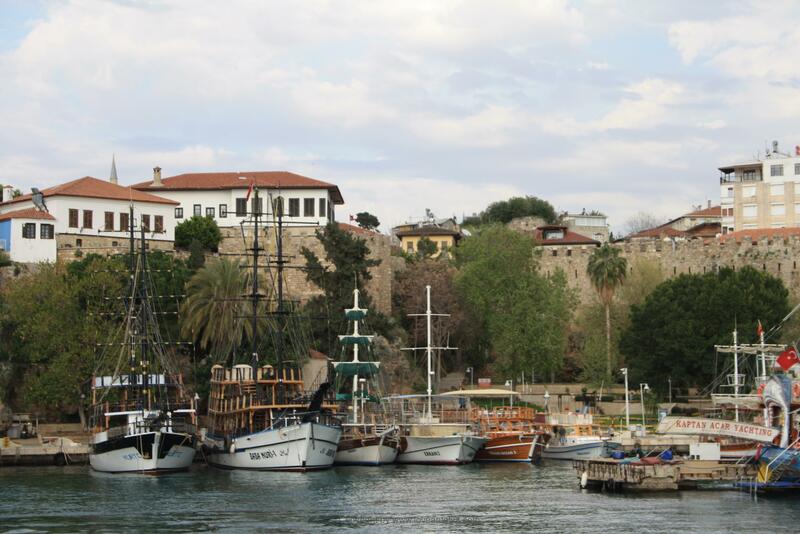 Fortunately, we know really many places in Antalya and surrounding areas, but there is always room for new ones. And this is how app’s like Foodspotting and Tripadvisor comes in. The latter is widely known and can be used for everything from sights to finding hotels and restaurants. Although there are a lot of recommendations in there, I often feel, that the places pay for good reviews. Some of the recommendations I can not understand at all – and have fallen in traps a few times. 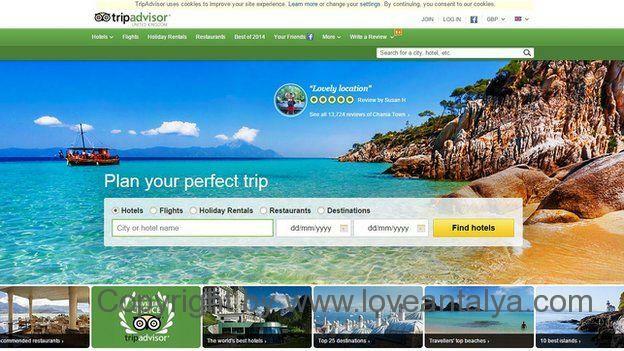 But overall, Tripadvisor is really good. However, I also tried with Food Spotting – an app. where users recommend smaller and larger eateries to each other. Here you have to take a picture of what you eat, and then write a small description. Something that has worked really well since 2010 – just not really in Antalya – unfortunately. In any case, I soon forgot the app, while I was on my go. Even though I had the best intentions, but there was simply not much that appeared. 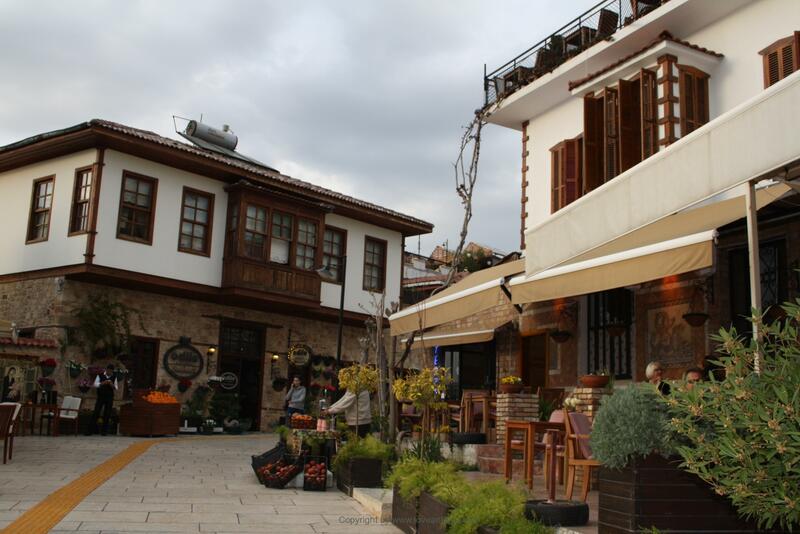 However, I could imagine, that it works quite well in cities like Alanya, Izmir and perhaps especially Istanbul. And right here regarding food I have to say, that I often look for different blogs to gather inspiration. I very often use ex. spottedbylocals.com, when I travel. There are really many good – and honest suggestions. 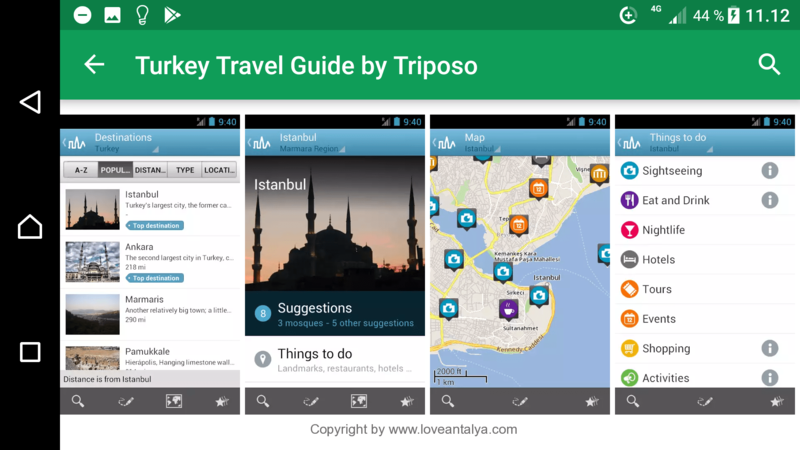 If you are looking for a “turkey travel guide” inside your app store, a lot of things will come on. The one from Triposo should be quite good. But try to investigate a little differently. Some of the most annoying while on holiday (in addition to bad food. Bad weather does not really exist in Turkey) is when you do not have internet. Isn’t it terrible, that you have become so addicted? You can of course try a regular detox, but I think, it’s very nice to be able to get online. We also have a little family, we usually need to coordinate with. 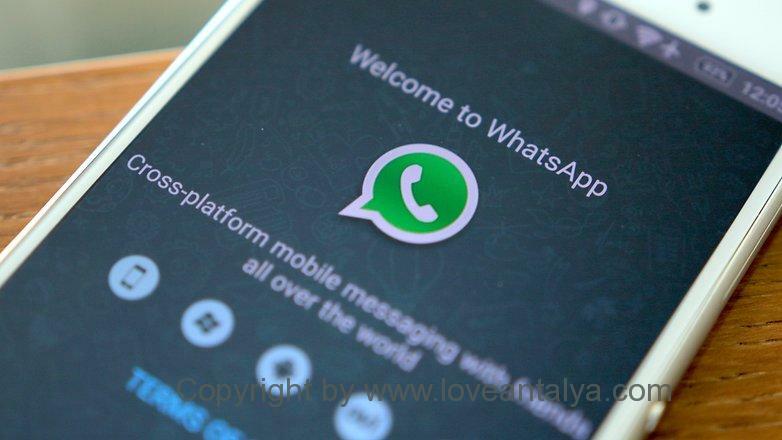 Right here I’m probably hopeless old-fashioned (still using skype, but it requires connection) but in spring I jumped to the “whats app” wave. An at least as easy way to communicate, talk and write as through Skype, but here you can also send your direct location to other travelers, so that you can find each other again, if you get lost. That’s pretty smart right ?? Xe currency helps you quickly, easily and accurately calculate the price and the price difference while shopping. I usually do it a bit by chance in my head, so I can only be surprised. Noted Places is a pretty good app, where you can create your own groups for restaurants, hotels, attractions, etc., and write down all your ideas. A pretty good way instead of all the handwritten notes, that you can quickly make (my husband will be happy if he’s reading this. He always complains over my little yellow post-it notes and all other notes I have everywhere) . And you can even share these notes with friends and acquaintances. Jubii – I like … !! At the “Turkey Newspaper” you can find news from all Turkish newspapers and even choose language. I have not tried it yet, but it sounds pretty smart. I love news and really miss them, when I’m in Turkey (it’s not all I understand on the television). If you have become more curious, there will be more good tips for travel apps about airline tickets, travel documents and hotels in Part 2. I promise to write about it soon. So stay tuned … ..